On Wednesday November 11, 1998, Veterans Day, a State of Pennsylvania Historical Marker was dedicated at the former site of the Naval Air Warfare Center (NAWC) and formerly the Naval Air Development Center (NADC) in Warminster, Pennsylvania. 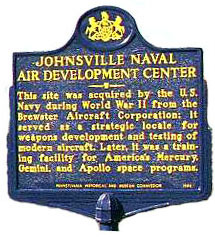 The marker was placed at the southeast corner of the base property on Street Road (Rt 132) adjacent to the Johnsville Inn and across the street from the 7-11 market. The links below will take you to pictures and information about the dedication.